Number of traditional Big Game kills: Don’t recall. There was a time when I was younger that I shot a lot of game. Either the game is getting scarcer or I’m slowing down. (George Nagel)- I grew up in rural Minnesota, south of the Twin Cities. My grandfather who was my mentor and best friend raised me. I learned so much just following him around as a kid. At 18 I started college but the draft numbers were getting close so I joined the Army. After that it was school again and starting a family and a business. I am married to a wonderful gal, Eva. We’ve three boys: Matt 35, Jim 33 and the archer in the family, Luke 14. I’m an architectural designer, have owned my own outfit for almost 35 years and am looking at retirement in the near future…or at least slowing down a little and spending more time hunting and traveling. We have a lake cabin in northern Wisconsin, which borders thousands of acres of public land, wonderful hunting and fishing in that area. 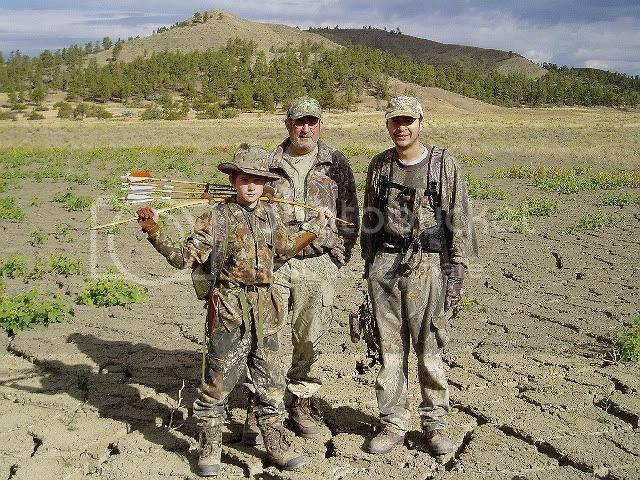 (TG)How long have you been hunting with traditional gear: Except for a brief period in the early 90s when I did the compound thing, the whole time. There was a period when I was hunting with a rifle more than with a bow, due for the most part because my hunting partners were mainly using rifles. Because of the more liberal seasons, all of my hunting buds are using a bow now. I hunt with traditional gear and most of my friends are using compounds. The past few years have been great because through the online traditional web sites like the Trad Gang, I’ve met many very nice people who I’ve hooked up with for some great hunts. (George Nagel)- I admire most of the “original” traditional people like Fred Bear, Hill, Pope and Young. There are many around today who are making a great contribution to our sport, who’s names will be remembered for years to come because of what they are doing. (George Nagel)- My grandfather. He gave me a pair of bows when I was fourteen. One was an osage selfbow and the other was a lemonwood bow. I shot those until I was out of the Army and could afford a Montgomery Wards glass recurve. I still have that recurve bow. (George Nagel)- Every hunting trip is a cherished memory, I can’t recall one I didn’t like. Living in the Midwest hunting deer and black bear is pretty much the normal drill. I always wanted to hunt wild hogs fair chase but didn’t know how to go about it. A few years ago Mickey Lotz invited me on a Florida hog hunt. That one hunt was as good as it gets. Very different from anything I did before. We all killed hogs with the Little Delta bow (Mickey, Dianne, Brian and myselfe.) The LDB and Mickey’s original Bear arrows add magic to the hunt for sure. “Irish” drove up and spent a day with us also. A good time was had. (George Nagel)- Small game, a robin with a toy bow when I was about 8, traumatized me immensely. Big game, a doe, I was hunting with good bud, east of Hinckley Minnesota. (George Nagel)- It changes every season with whichever bow I’m using.. I’m pretty open to trying different setups. Recurves, longbows, selfbows and wood arrows…it’s all archery and I love it. (George Nagel)- I notice that so many people new to traditional archery take things too serious and expect their progress to be fast. My advice would be to loosen up, slow down and enjoy yourself, things will gel in time. Archery is meant to be fun. Most of us aren’t and never will be Howard Hill or Byron Ferguson. Heck, some of the best bow hunters I know aren’t necessarily good shots. They know their limitations and hunt within them. (George Nagel)- Elk. I just like being in that beautiful western country. I make a point to go every year. Whether I kill something matters very little anymore. I just like being there, a big camp with old hunting partners to share it with. Our kids do the really serious hunting nowadays. Those hills somehow grow steeper every year ya know. (George Nagel)- Nope! I’ll try and use whatever method seems good at the time. (George Nagel)- Everyone except my wife….she watches and encourages us. (George Nagel)- My Grandfather. He gave me those bows but told me it was stupid to hunt with anything other than a 30-06. So being an obstinate kid, I hunted with the bows. I know he was inwardly proud, but would never admit it. (George Nagel)- This season is almost over, I’ve harvested a deer and that’s all I want. I’ll spend the remaining time trying to help my youngest to shoot one. He’s been very close a few times this season. (George Nagel)- I make all of my bows except the glass recurves. Cooter just gave me a couple of recurve forms he found stored in an old barn, probably from the 50’s, I’ll attempt a recurve with those this winter. I also make my own arrows, quivers and most other equipment. It doesn’t take much, I don’t need much. I think my quiver is ten years old now. (George Nagel)- Africa or Oz I think is everyone’s dream hunt. Realistically, I’d like to do a Kansas whitetail hunt for one of those 160 class bucks. Another caribou hunt would be nice or even a south of the border couse (sp) deer hunt. As our years increase our ability to climb the high hills decreases so we have to be realistic and hope to do hunts within our limits. (George Nagel)- Both. Depends where and what for and when. (George Nagel)- Now Mr. Lotz and I were discussing the merits of sleeping in in the morning, as we all managed to do in javi camp last winter. As ones years increase ones desire to draw blood decreases. The experience of the camp, the friends and comradery somehow become the important factor. Now my point is…Aren’t we all a bit more pleasant if we aren’t crawling out of a sleeping bag onto the cold ground at 4 AM? But sleeping until our bodies have fully recovered from the leisurely afternoon hunt of the day previous? Now I am not an expert on this…but everyone in javi camp was of the same mind. (George Nagel)- Very seldom. I don’t believe not using those things has hampered me the least. The critters try to avoid me whatever I’m wearing that day. (George Nagel)- A grouse or a bunny for the pot is about it. The squirrels in these parts are a bit shy for a bowhunter. (George Nagel)- I think I answered that one already. I do however have a reoccurring dream of shooting a monster 7x7 bull elk… and watching him fold up 20 yards from my pickup truck.